If you are a carpet owner with furry friends, then you have probably explored ways to keep your home looking and smelling fresh. While pets provide us company, they can also contribute to our home with unwanted odours. One of the best ways to maintain a fresh and clean home is to keep your carpets clean. Regular vacuuming is important, but it is not sufficient when dealing with pet odours. The oils and fur from your pet’s skin can sit in deep into your carpet fibres, making it difficult for vacuuming alone to remove the odours. It is recommended to have your carpets professionally cleaned on a basis to help get rid of these unwanted odours. When choosing the right carpet cleaning for your home, also make sure to consider your pet’s health and safety. Just like us humans pets probably spends much of its time curled up on your carpet, so choose a carpet cleaner that you can feel good about. The health and safety of your family and your pets is priceless. Don’t risk it by using harmful cleaning products in your home. You can achieve the results you want without jeopardizing by sticking with all natural cleaning products that are safe. 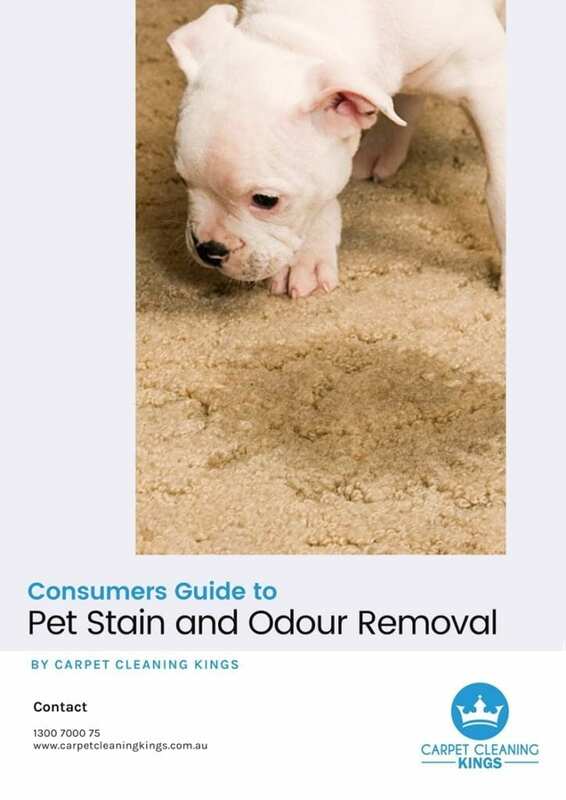 Here we are going to provide you with 7 best tips to remove the pet’s urine odour and stains from the carpet. 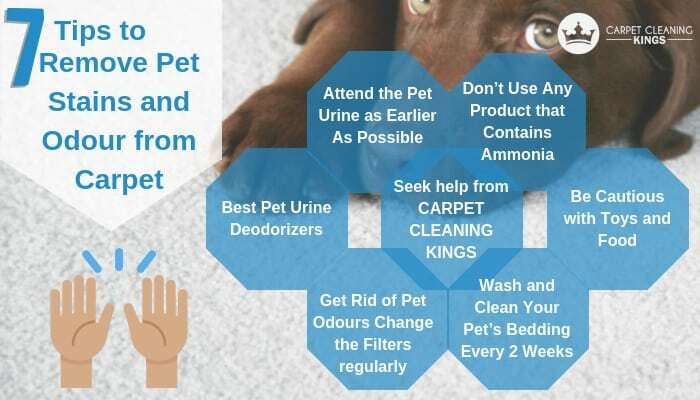 Pet urine become difficult as it residues on the carpet which suggests that we need to remove it as soon as we have spilt it for the first time. Blot with a clean towel to stop the urine from seeping deeper into the carpet. when you are trying to clean the pet urine from the carpet yourself, especially cat urine make sure to prevent any cleaning products that contain ammonia. As cat urine contains the ammonia, it will only worsen the situation. Vinegar is the best deodorizer for removing the pet urine stains and odour from the carpet. To remove pet urine stains from the carpet with vinegar, mix one part of lukewarm water with one part of vinegar. Spray the vinegar solution onto the carpet (or you can also pour it) and clean it with a scrub brush. Clean and let dry, then scatter with baking soda and vacuum it up. it’s a well-known fact that cats and dogs do not like to urinate in an area where they play or eat. As you’ve completed the cleaning, and as the area dries, place some toys and food bowls in that place to prevent any repeat performances. it is always essential to remove and change the filters of your AC to get rid of pet odours. If you’re not regularly changing the filters often enough, those bad pet smells will just keep moving throughout your home sweet home. It mostly happens that pet’s owners often forget to change and wash their pet’s bedding, Odours from the bedding can overhaul your pet and the whole house! The only way to get rid of these bad odours is to clean and wash your pet’s bedding every 2 weeks. Once the urine has dried out, it will become much harder to remove the odour. The place should be extensively cleaned in advance allowing it to dry. If it is already dry, then give the experts a call to have it pre-inspected and properly remove the odour and stain. 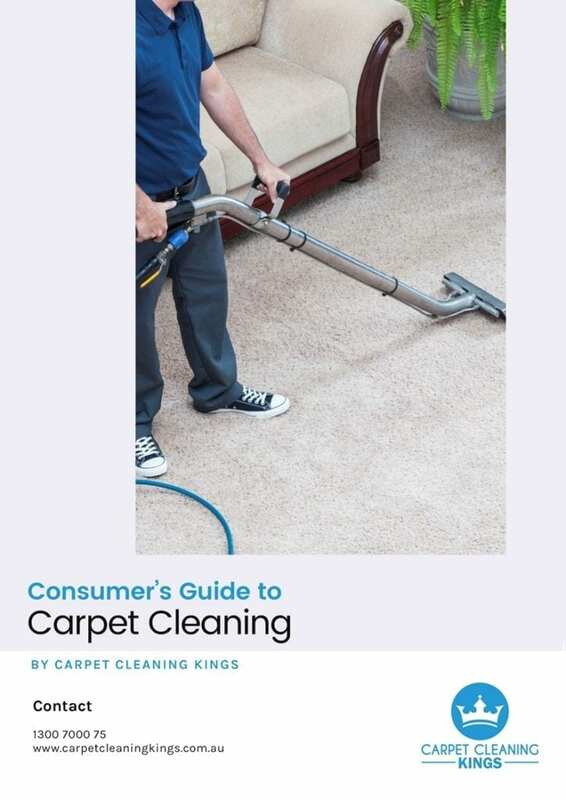 Carpet Cleaning Kings use products that are safe to you, your family and pets. You don’t have to worry about the chemicals from your carpet cleaner are affecting your pet’s skin and all around health. Pet urine in the carpet not only leaves an unappealing stain and an unpleasant odour. If not treated properly, the odour from pet accidents can travel through the entire home and can affect you and your family’s health. The smell produced by an accident also often leads to repeat incidents in the same area until it is properly eliminated. 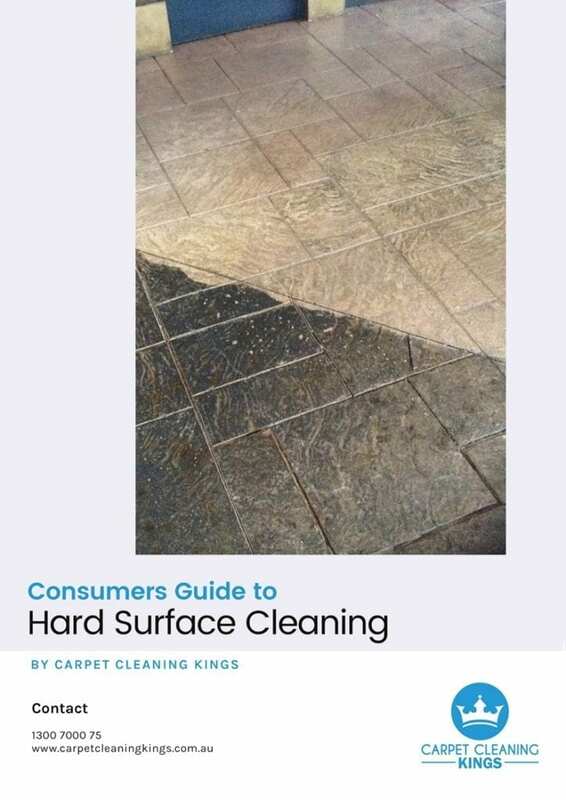 That’s why it can require specialized cleaning from the professionals like Carpet Cleaning Kings, well beyond just a simple cleaning and treating. The longer an incident goes untreated, the more likely the urine odour is to permeate deeper and deeper into floors, walls and even the framework and foundation of the home. As the urine dries, the liquid evaporates but the urine crystals become even more concentrated and overpowering. Professional carpet cleaning should be scheduled at least once a year but if you have a family pet you may want to consider a twice a year cleaning. This regular scheduling will keep your carpet looking and smelling fresh as well as reducing the need to replace the carpet before its anticipated lifespan. 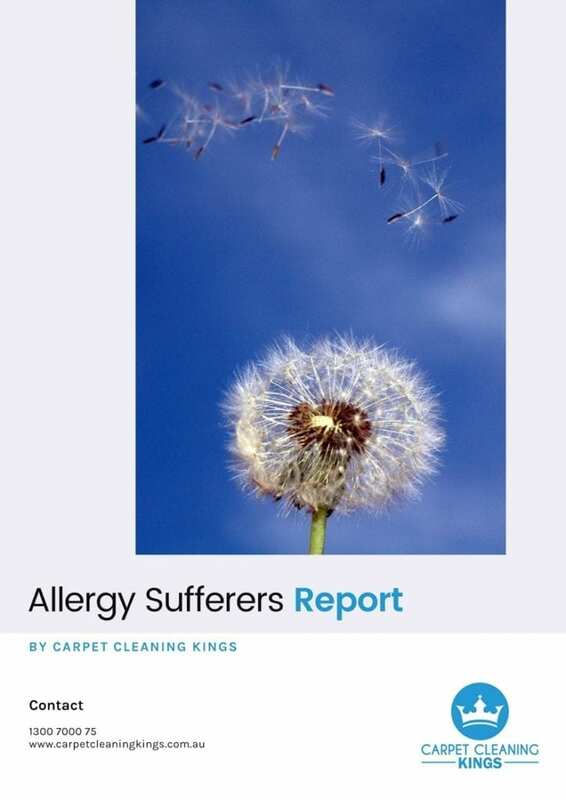 A schedule of regular professional carpet cleaning employing the services of those familiar with the range of requirements will remove the offending microbes in your carpets and rugs, breathing new life into them so your home can look and feel clean. Having your carpets professionally cleaned will preserve your carpet’s appearance and cleanliness while having your furry friends around the house. Carpet Cleaning Kings will help you have a pleasant relationship with carpet and pets. 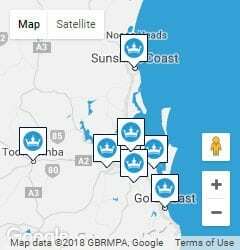 Call us now on 1300 7000 75. Great!!! Thanks for the informative article.